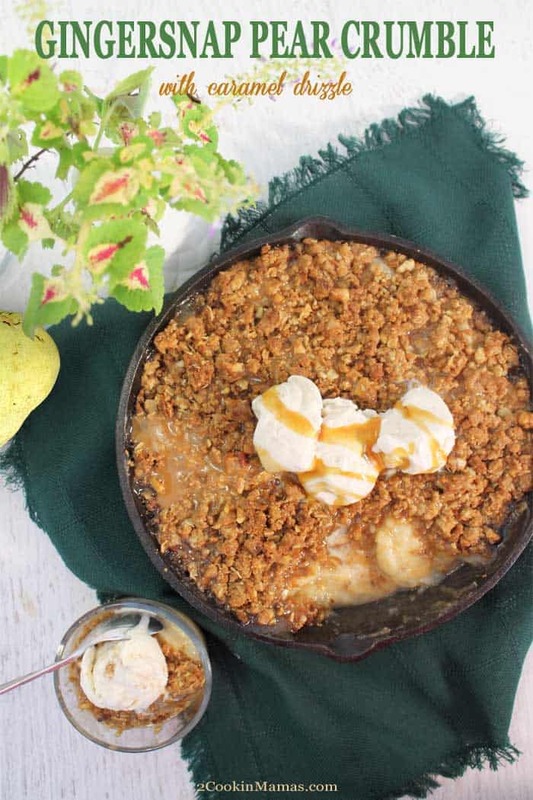 This easy Gingersnap Pear Crumble is just what you need to greet the autumn season. 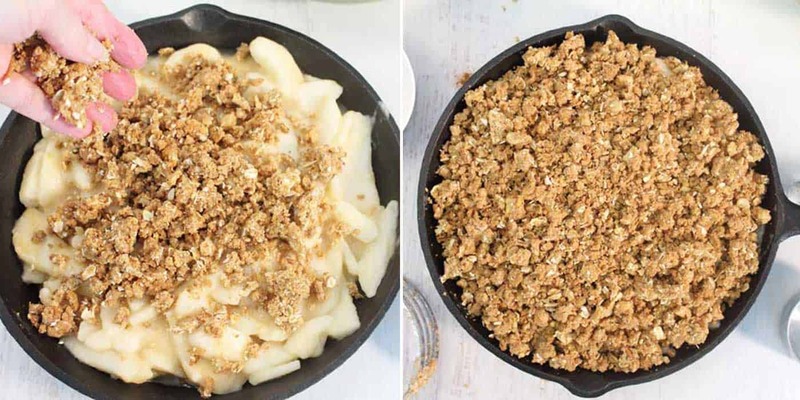 A sweet pear filling, seasoned with ginger, is topped with a nutty gingersnap-oat crumble that bakes up sweet and crunchy. Great to serve warm with a scoop of vanilla ice cream and a drizzle of caramel sauce. A dessert that’s casual enough for everyday and delicious enough for company. Hellooo Fall! I simply love fall! In Florida it’s not so much the cooler weather and the turning of the leaves, although I do love that and so wish we could have that weather here, but all the flavors that go with the season. I think apples, pears, pumpkin, cinnamon, ginger, squash, persimmons and sweet potatoes. 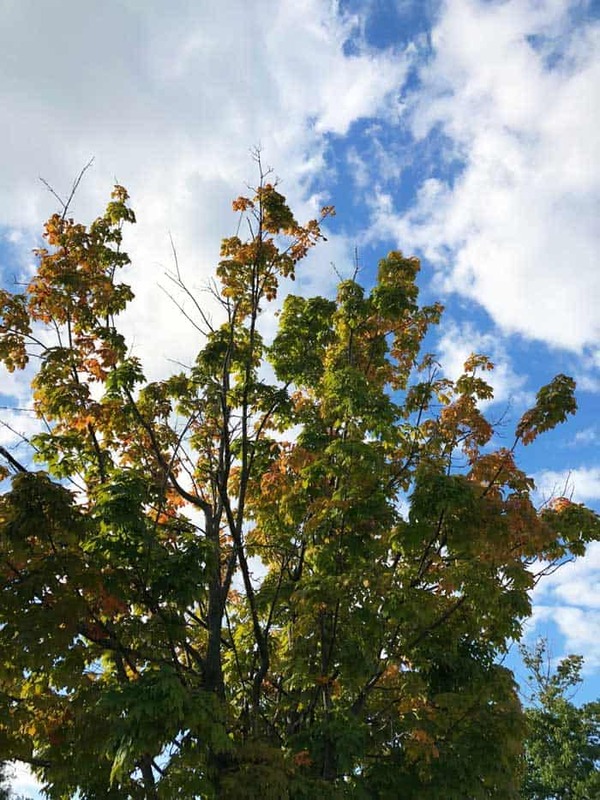 I have to admit that I did get to see the tiniest tinge of fall when I went to see my sister in Michigan last week so at least I’m feelin’ the season even though it’s still in the 90s outside. 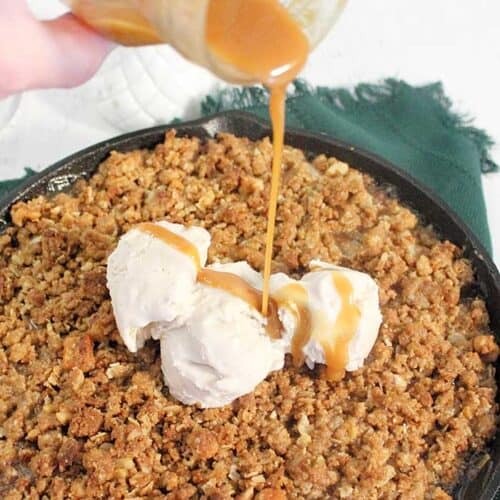 Now I’ve made Apple Cider Doughnuts and Pumpkin Streusel Muffins but this gingersnap pear crumble has got to be one of the top desserts to start the fall season. 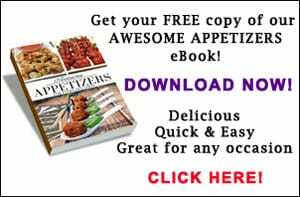 It’s so easy to make and so delicious you’ll wonder why you didn’t make it sooner. It’s all made in an iron skillet with just a couple bowls and a spoon to clean up. It’s relatively healthy for you with no bottom crust and just a crumble on top and it has a ginger snap to it that gives the milder pears exactly what they need to shine. 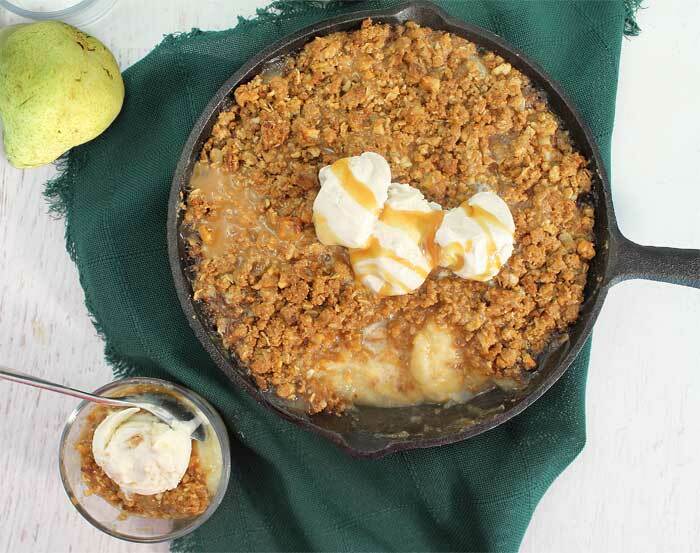 A few easy steps to make the perfect autumn dessert – Gingersnap Pear Crumble. Peel and core pears. 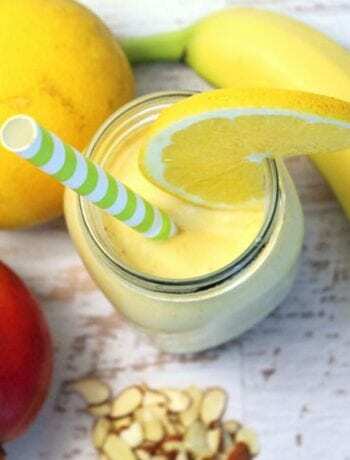 Toss with lemon juice and vanilla extract. Add pears to a dry ingredient mixture of sugar, flour, ginger & salt. 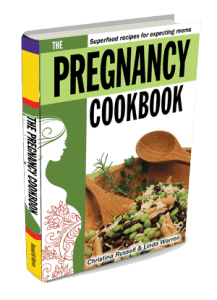 Pour into prepared iron skillet. Crumb gingersnaps. I like to use my Ninja Chopper as it makes it so quick and easy. You can also crush by placing the cookies in a large ziploc bag and roll over them with a rolling pin. 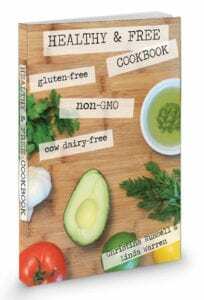 Combine flour, brown sugar, oats, walnuts and cinnamon. Using a pastry cutter, work butter through dry ingredients until it resembles crumbs. Sprinkle on the crumble and it’s ready to bake. Now the best part! 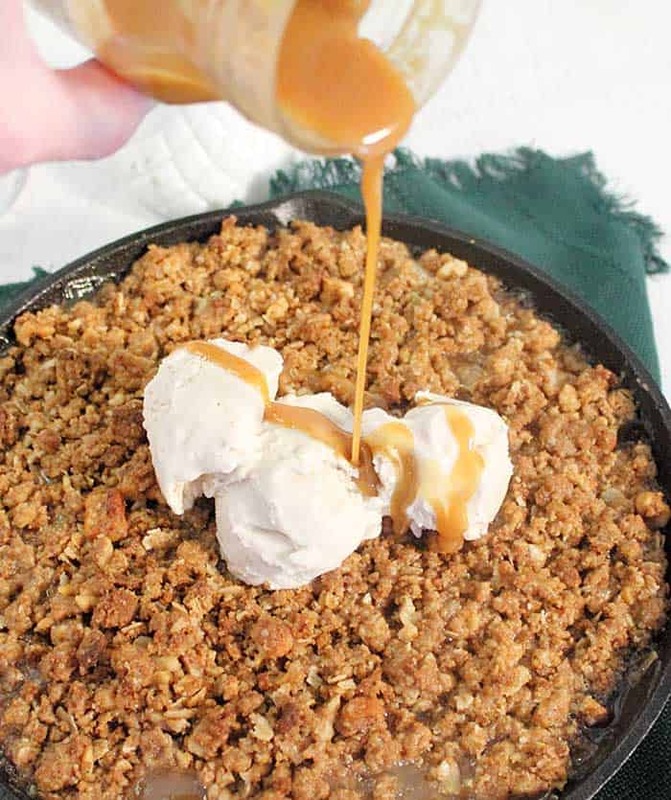 Place a couple scoops of vanilla ice cream on top of the pear crumble, then drizzle some warm caramel over all. 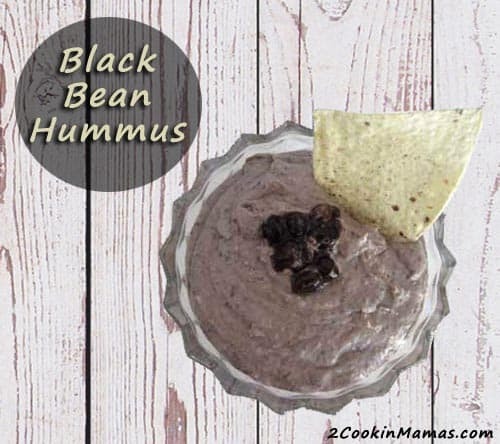 Of course, this is totally optional but it’s oh so good! 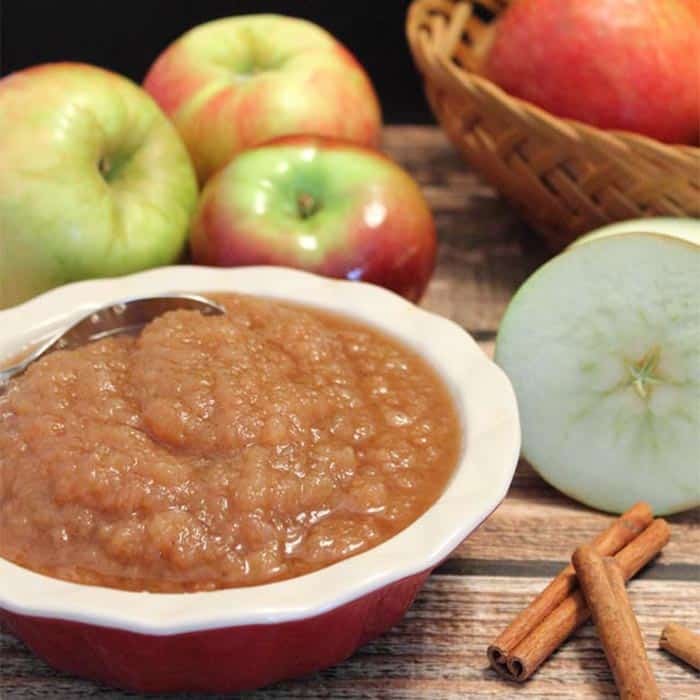 Now take a bite of this sweet, warm goodness and you’ll feel like fall is really here! 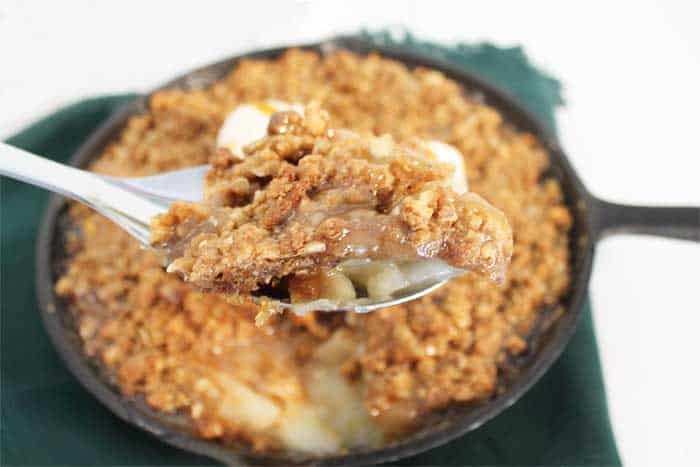 This easy Gingersnap Pear Crumble is just what you need to greet the autumn season. 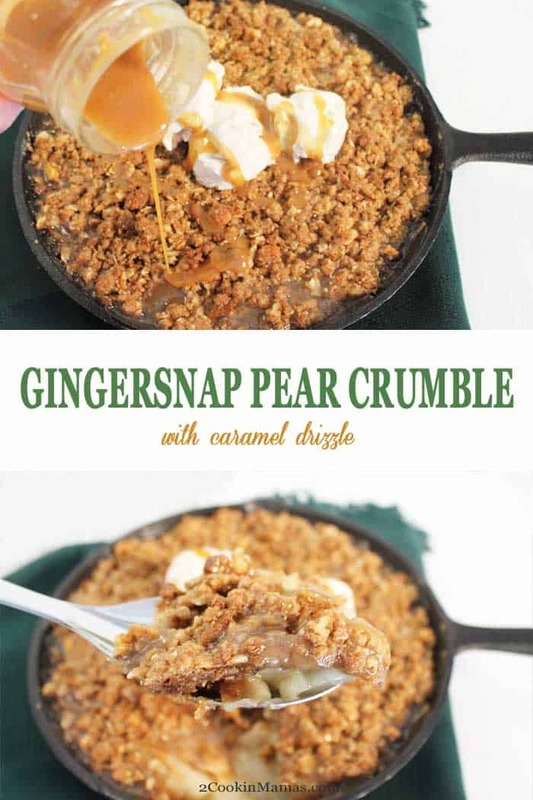 A sweet pear filling, seasoned with ginger, is topped with a nutty gingersnap-oat crumble that bakes up sweet and crunchy. Great to serve warm with a scoop of vanilla ice cream and a drizzle of caramel sauce. A dessert that's casual enough for everyday and delicious enough for company. Preheat oven to 375 degrees. Spray a 10” iron skillet with nonstick spray. In a small bowl, combine flour, sugar, ginger and salt. Peel and thinly slice pears and place in large bowl. Sprinkle with lemon juice and vanilla extract and stir. 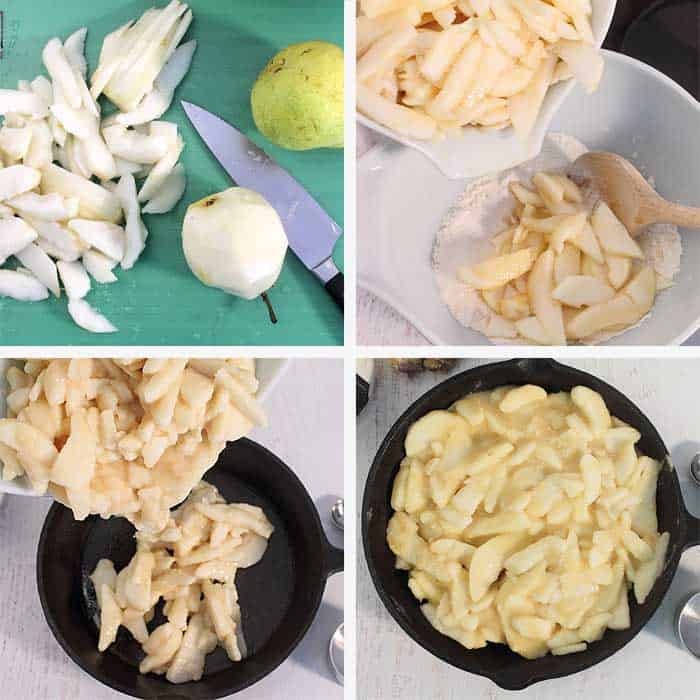 Add dry mixture to pears and stir gently until all pear pieces are covered with mix. 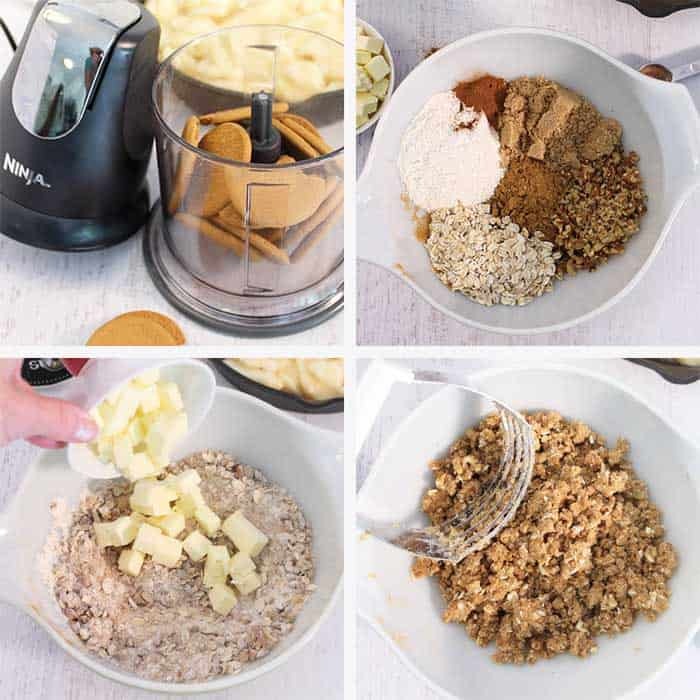 In a medium bowl, combine gingersnaps, flour, sugar, oats, walnuts and cinnamon. Stir. Take butter from refrigerator, cut down center of stick then cut horizontally into small cubes. Add to gingersnap mixture. Using a pastry cutter, cut through mixture until it resembles coarse crumbs. I like to use my hands at the end to make sure there are no chunks of butter and all the dry mixture has been coated. Sprinkle on top of pears. Remove carefully, remembering to grab the handle with a pot holder. Place on wire rack and let cool for 10 minutes. Drizzle hot caramel sauce over topping. Serve warm with a dollop of vanilla ice cream on top. You can even drizzle more caramel sauce if you want. It’s also great chilled as is. I couldn’t possibly ever live in Florida, I love having a nice fall too much! I can practically smell this pear crumble in my kitchen already!! In October I like to go and visit up north so I can catch all the beautiful fall colors. But when I bake, all the aromas make me feel like it’s fall here. This is the perfect fall dessert! It’s pretty rainy in here so this will be a great treat! This is perfect served warm. It’s like a comfort food for dessert. Great for a rainy day.